At 1 a.m. on Sunday September 2, at the end of the particularly long, dry, hot summer of 1666, fire broke out in Thomas Farriner’s bakery on Pudding Lane in London City. Fanned by a fierce easterly wind, it spread quickly to the warehouses on the riverbanks. Filled with pitch, ropes and timber, they exploded and fuelled the fire’s race through the crowded wooden houses which overhung the narrow streets. Pandemonium followed. People fled in wild panic before the advancing flames. The streets were soon packed with carts stacked with household goods and people laden with whatever treasures they could carry. Carters, exploiting the situation charged outrageous prices. Thieves and looters ran through the abandoned houses seizing whatever they could. Vigilante groups hunted down scapegoats among the city’s long distrusted foreign communities. 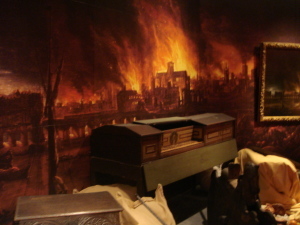 Others bravely fought the blaze, including the King and the Duke of York. In a desperate attempt to stop the advancing inferno, forces of soldiers and sailors were organized to blow up houses in its path. Finally, after five days, the wind dropped and the fire died down. It took the city years to recover. Slowly some people moved into the city, rebuilt their houses and re-established their businesses. Others never returned, choosing to remain in the new settlements further out. Witch hunts continued and foreigners were held in suspicion. However, in the end, the blame was placed on greed, as the blaze had started in a bakery on Pudding Lane. A golden statue of a fat little boy stands on the corner of a building near Smithfield Market as reminder of the fire and of the wages of the sin of greed. 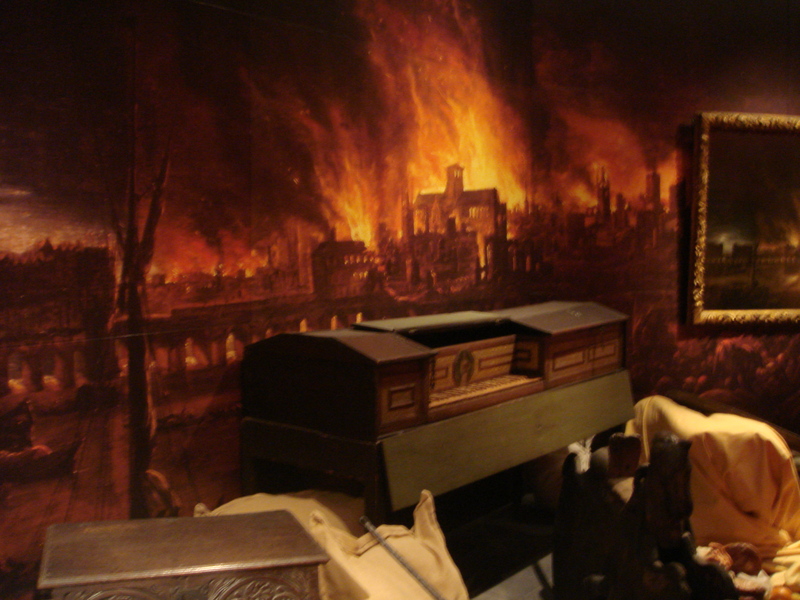 The Museum of London, in Aldergate Street in the City, has a wonderful exhibition on the Great Fire of London. It tells the story through the real life experiences of famous writers, like diarist Samuel Pepys and also of some ordinary citizens. It explores the questions; How did people cope? Who caused the fire? What were the lasting effects? 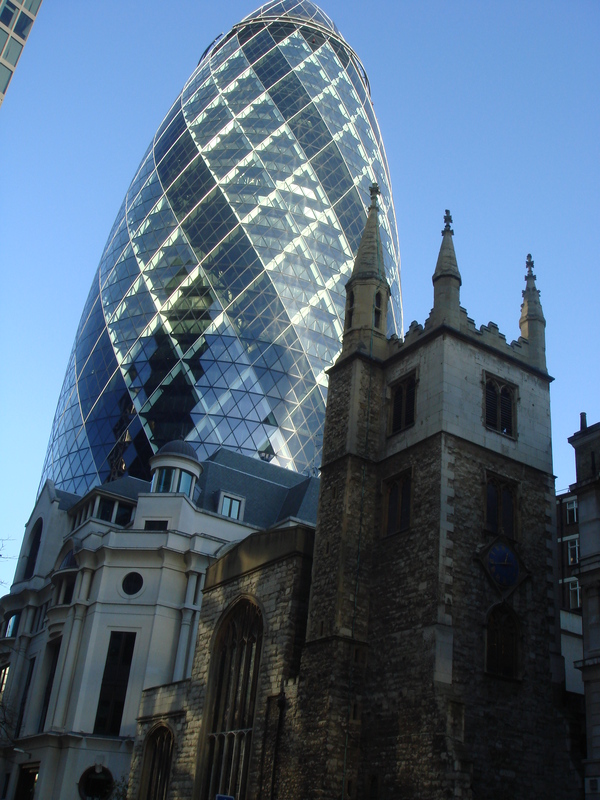 The museum, which sits alongside the ancient city wall, also explores the history of very early of London and Roman London.